My hunny doesn’t like veggies. Not one little bit. There are a couple that I can get him to eat. Corn, if it’s on the cob, broccoli if it’s only a couple ”trees,” sweet potatoes, if they are fries. Salad, but only when doused in ranch or it’s a caesar with no cheese and minimal croutouns. Just a salad for dinner? No meat or only a small amount of chicken? For-get-about-it. And of course, he has the metabolism of a 12-year-old, so he can get away with it. Sometimes I hate that fact. 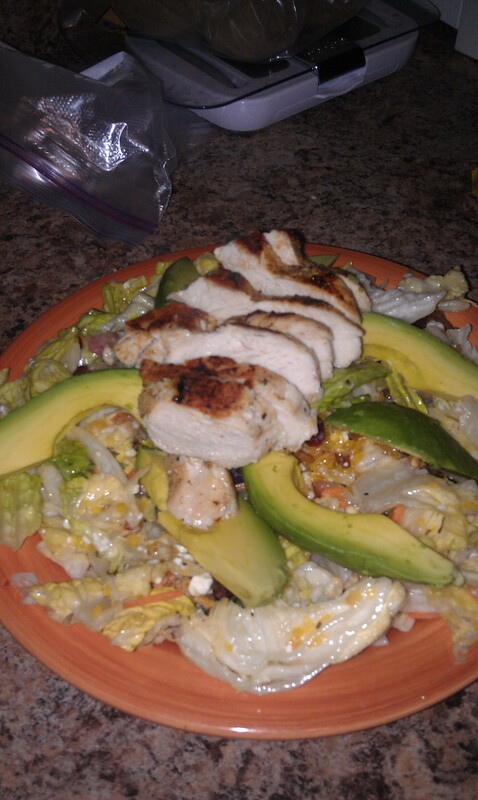 So since he’s off doing what he does, I can have a salad for dinner. I’m trying to watch what I eat and not just be on a “see-food” diet, so salad is a good thing. What’s I’ve found though, is that a lot of people who try diets hate salad. But they have this crazy idea in their head that salad is some lettuce and some dressing. And that it’s boring and tasteless and miserable to eat. But one of my favorite things is that you can mix salad with anything. Whatever kind of great flavors you like, it can go in a salad. It doesn’t just have to be tomatoes and croutons. My salad tonight was a smorgasbord of yummy goodness. I actually made too much, and I’m hoping it will keep in my fridge for a couple days so I can enjoy it again. My salad started out with a mix of romaine lettuce and iceberg lettuce. I like crunchy leaves, but a lot of people like the spicy crispness of arugula. Then some tomatoes went in, followed by dried cranberries, mandarin oranges, bleu cheese, carrots, pecans, and some crumbled bacon. Though not very good all by it’s lonesome, one or two slices of crispy bacon crumbled into a salad adds a nice saltiness and crunch. Everything in moderation people. So then my salad was topped by avocado (yes, a whole one; I like the green stuff), and grilled (on my George Foreman Grill) chicken breast that was spiced with garlic and some red pepper and black pepper and onion spices. Finally, I took some of the mandarin orange juice, lemon juice, garlic powder, lemon pepper, salt, black pepper, and oregano, mixed it with olive oil, and tossed the salad in a bag so that it was evenly coated. Served with a little bitty biscuit, and I’m a happy girl. The moral of the story is that a salad doesn’t have to be boring. Mine was bright and vibrant and crunchy and delicious. If you like the flavor of something solo, there is a good chance it could be incorporated into a salad somehow. Ask me, I’ll tell you how.